The San Juan Festival is held in the evening of the 23rd June, the longest night of the year, and the official start of the summer. Celebrations will be held in most towns and communities here on the Costa Del Sol, with fireworks and the burning of effigies at midnight for the San Juan Festival. In Mijas Costa, as in other areas along the coast, this is the one night of the year when you are allowed to light fires on the beaches. This is definitely one in the event calendar for the whole family, with a great relaxed atmosphere. People swimming, playing games on the beach and of course large family picnics until the early hours of the morning! The summer solstice remains a magical night in much of the northern hemisphere. Mythology states that strange things can occur on this shortest night of the year. Certain pagan gods are said to make themselves visible during this night. The magical night of the San Juan festival is all about changes. It is about night and day, fire and water. Fire purifies and water recuperates, refreshes, and rejuvenates. Bonfires are the theme of the night. Men and women, young people and children all spend time building these bonfires. 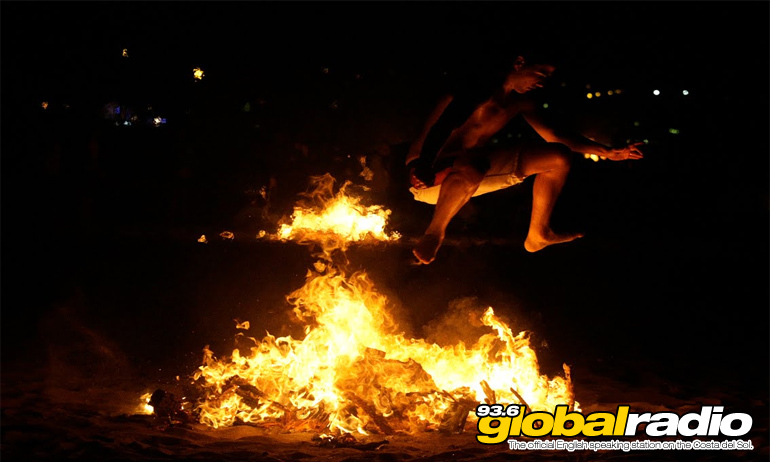 According to tradition, if people jump over a bonfire three times on San Juan’s night, they will be cleansed and purified. It is ritual that rules at San Juan. After midnight, people wash their faces and feet three times in order to be granted three wishes and for a happy twelve months thereafter. Bathing at this time is also said to be beneficial for skin complaints. Traditionally, the Spanish did not visit the beach until this day in each year. As well as the bonfires that burn continuously, there are also dolls that are burnt. This is usually done around midnight as well. Originally, the effigies were supposed to represent Judas Iscariot. Now the religious relevance seems to have become secondary to the enjoyment factor. Quite often the dolls are made up to represent local or national personalities who are famous (or sometimes infamous). The burning of these effigies is supposed to bring good luck but quite often, it is just good fun and it makes a great spectacle. Some of the effigies can be quite elaborate.